Obituary for Seivewright "Gordon" B. Mortley | Frank R. Bell Funeral Home, Inc.
Gordon Mortley's American Heart Association tribute website. Seivewright “Gordon” Mortley, was born on January 19, 1934 in Uitvlugt, Guyana to Dulcie Mortley and Winslow Shervington, both deceased. He was the only child for his mother Dulcie but was blessed with an older brother George (deceased) with whom he was extremely close, a younger brother Chris and sisters Connie, Wilma, Dawn and Andra Mae. After his mother’s death in his teens, Gordon, fondly called Shervo, was raised under the loving guidance of his aunts and his most beloved Auntie Thel, the mother of his younger siblings. In 1956, Gordon moved to London, England, and a mere year later, sent for the love of his life, Joy Kendall of “GT”, to whom he uttered his last words in this world. They were always together; since marriage, their moments apart could be counted on one hand. Gordon and Joy started their family in England giving birth to Diane and Julie and then responding to a patriotic call, the Mortleys moved to Guyana in 1966. 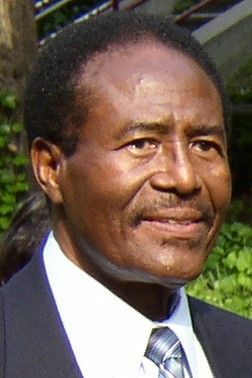 Contributing to the growth of the newly independent Guyana, Gordon worked in the Ministry of Health and Housing and the Guyana Water Authority. Ever looking out for the best for their family, the Mortleys moved to the United States permanently in 1978 to pursue higher education opportunities for their daughters. Gordon became a counselor for the city of New York in the Bedford-Stuyvesant Community Mental Health Center where he discovered a latent talent for learning about medications. Gordon meticulously supervised that “home” and guided the residents entrusted to him until he retired in 2003. Gordon lived a rich life spanning decades, continents and generations. It was filled with an unerring commitment to family togetherness, kindness to those less fortunate and an unflagging belief in God. He was unquestionably devoted for over 61 years to his wife Joy. He was a beacon of love to his daughters Diane and Julie, son-in-law Karl and grandson Noah, an advisor to his siblings, nieces, nephews and countless friends. Ever the socialite and comedian, Gordon will be sorely missed by many and gladly welcomed by his Savior and those who have passed before him. God Speed, cherished husband, father, grandfather, brother, friend. We will love you always!